Kaydon Bearings celebrated its 75th anniversary on Monday, May 16 with events planned for its facilities in Michigan, South Carolina, Ohio, Mexico, China, and Brazil. The Kaydon Engineering Corporation was founded in May, 1941 by A. Harold Frauenthal in Muskegon, Michigan, and its original location is still a Kaydon facility today. In a commemorative release on the company’s website, some of its benchmark achievements are remembered. 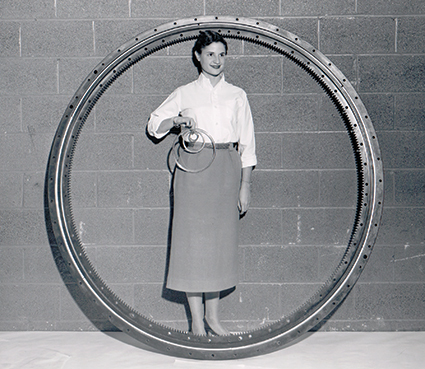 Kaydon bearings were on Apollo spacesuits and in some of the first CT-scanners, used for CAT scans. During the past 75 years, Kaydon Bearings has built a tradition of solving demanding bearing challenges, as seen with the invention of Kaydon Reali-Slim thin section bearings, still considered an industry standard for a variety of industries such as semiconductor manufacturing, industrial machinery, aerospace, aviation, medical equipment, heavy equipment, medical systems, radar, renewable energy, and robotics. Now an SKF Group brand, Kaydon engineers continue to innovate to meet the changing needs of industry and work closely with customers to meet performance requirements. SKF acquired the business as part of the Kaydon Corporation, which it bought for $1.25 billion in 2013. The Kaydon thin section bearing product line includes Reali-Slim and Ultra-Slim; Real-Slim TT turntable; and custom thin section designs. Slewing ring bearings include four-point contact, eight-point contact, cross roller, three-row roller, and wire-race configurations. Kaydon also provides slewing ring bearing remanufacturing and replacement services.